Today marked a significant day in Aggie basketball history. Billy Kennedy and his staff received signed Letters of Intent from four national top-75 recruits in the class of 2015. The addition of DFW-area standouts Tyler Davis, D.J. 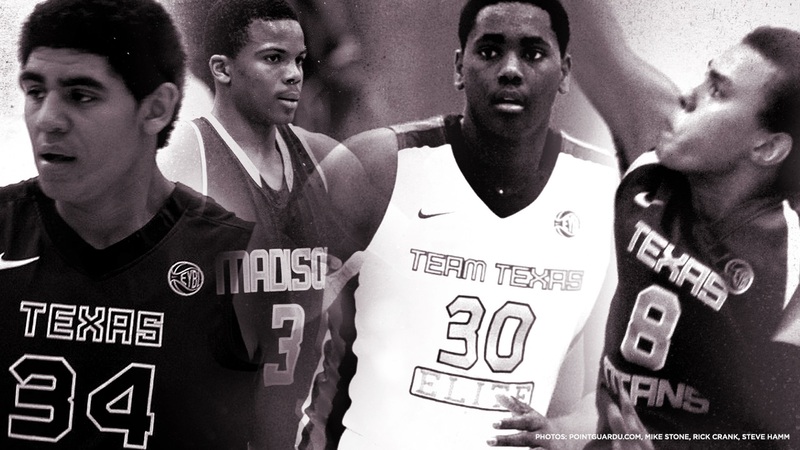 Hogg, Elijah Thomas and Admon Gilder all but solidifies Texas A&M's as one of the top three recruiting classes in the country this year. By the end of this basketball season, three out of the four signees (Davis, Hogg, Thomas) could end up as five-star recruits and the fourth (Gilder) could find himself in the talks of being a potential five-star recruit. "Great day today, netted four quality young men and really good players we're excited about," Kennedy said. "It's a relief to finally get them signed and that behind us. Got to give our staff and players (credit), they did a tremendous job selling our university and our product. It's been a three-year effort." Davis, a 6-10 center from Plano West high school, was the first Aggie commit for the class of 2015 and is the piece of the puzzle that started the huge wave of momentum the men's basketball program is currently riding. Davis has the ability to score in the paint as well as knock down a 15-foot jumper. He will add a much-needed rebounding presence on the roster and a toughness factor on both ends of the court. Many people consider Hogg to be one of the top three-point shooters in the country — if not the best. His ability to spread the court and stretch the defense with a deadly outside shot will give Tonny Trocha, Davis and Thomas more room to maneuver in the paint. Davis is a skilled player with good hands, good footwork and nice touch around the hoop. He will vastly improve the post presence play for the Maroon and White. Hogg, a 6-8 perimeter player and current teammate of Davis at Plano West, was the second recruit to commit to Kennedy and Texas A&M. Many people consider Hogg to be one of the top three-point shooters in the country — if not the best. His ability to spread the court and stretch the defense with a deadly outside shot will give Tonny Trocha, Davis and Thomas more room to maneuver in the paint. Hogg isn't just a one dimensional player, as he can also put the ball on the floor and utilize the dribble. Gilder is a dominant guard that can handle the ball and score with the best. His fierce and competitive nature on the court drives his will to win. He led James Madison high school to back-to-back State championships, while garnering the championship game MVP award. Not only can the 6-3 Gilder score, his versatility will allow Kennedy to play him at the one, two or three position. He is a tough, hard-nosed player that adds scoring, competitiveness and a winning mentality to the team. Although Thomas was the last of the four early signees to pledge his commitment to the Aggies, he was the first to fall in love with Texas A&M's traditions. Before suffering a finger injury, Elijah was ranked in the top 10 in the country. His ability to score with his back to the basket and grab rebounds above the rim will immediately improve the Aggies production on the court. The combination of Thomas, a 6-9, 240-pound power forward, and Davis, a true center, will give opponents in the SEC trouble at both ends of the court. They will eat up a lot of space in the paint when guarding other teams, while also freeing up the guard on offense because defenses will have to stay home to protect the rim from the big guys underneath. "When we got Tyler Davis we thought right away it would eliminate Elijah and Tyler was like, 'No, Coach, go get him,' and it made Elijah more interested," Kennedy said. "These kids know they can play together and it's a great luxury to have. Since I've been here, front-line players have been scarce. "They've got great hands and great feet, which is a good combination for big guys. They're smart, different in their play somewhat, but their ability to pass, catch and score gives them that luxury of playing together." Overall, Kennedy addressed and upgraded the needs on this roster by bringing in two true post players, a deadly three-point shooter and a guard that has the ability to run the team while also scoring at will. The addition of Davis, Hogg, Thomas and Gilder to the already existing core of Alex Caruso, Alex Robinson, Trocha, Jalen Jones, Davonte Fitzgerald and Danuel House will give the Aggies a very talented, deep roster. And while the incoming freshmen are highly touted and respected, there will be a mix of veterans on the team to lead and guide the youngsters. The 2015-2016 roster will consist of a well-rounded team complete with point guards, swing men, shooters, scorers, and post players. Kennedy will have options at every position (well, there will only be one true center on the team) and in some cases, namely the three spot, he will be forced to make some tough decisions about playing time. The battle for minutes between House, Fitzgerald, Hogg and Gilder will be fierce. Each of those perimeter players have their own unique style of putting the ball in the basket and each player can improve the team's performance and outcome of the game. The coaching staff will have to find a way to get them all on the court and successful players. Another important battle for playing time will be between Jones, Trocha, Thomas and Davis. Over the past three years A&M fans have had to watch undersized post players try to survive in the SEC, but next year, with a roster consisting of 6-9, 6-10 and 6-11, Kennedy and company will be able to game plan and counter attack their opponent's size. Matt Sachs, TexAgs The incoming elite talent will be guided by veteran leaders like Alex Caruso, Jalen Jones (pictured) and others to form a complete roster. And let's not forget the fact that Texas A&M is still in the running for Malik Newman, who is currently ranked number three in the country and the number one point guard in the 2015 recruiting class. Newman will wait until the late signing period to make his decision, but still considers College Station a viable option to continue his basketball career.